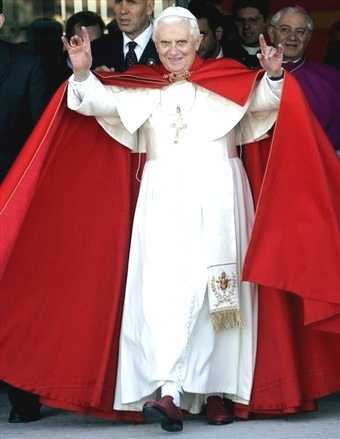 Pope Benedict doing the devil’s horns…this is a deception! You may have seen this picture used and reused across the internet where it looks like Pope Benedict is giving the sign of the devil’s horns. But a closer look shows a deception! f you look closely at his left hand, you will see a trace of a black under garment just behind his wrist but on his right hand it does not show. Pope Benedict supposedly showing the devil’s horns.